So as promised...a recap of the Cherry Tree Relay Race. So it seems the rule of this race is that it must be cold! Last year I think I lost all feeling...fortunately this year it was not quite as cold. However, leave it to the MTA to make things interesting with all the service advisories. Since the "F" train was running express through the stop we needed to get off at to get to we had to add an extra 8 blocks for number pickup. Fortunately, pink monkey's teammate lives in Brooklyn and was able to pick up our packets for us:) My team, the speedy beagles, was ready! Except for choosing an order...we knew Sempre Libera was the anchor (she had no choice in that matter!) but AB and I were indifferent to who went first and second. So we did what anyone does in this case..paper,rock scissiors! I lost so I was the middle woman! About 23 minutes later, AB comes around the bend and hands off the slap bracelet! Not without incident as we almost bump into eachother...not exactly a smooth transition! I start my run and laugh for the next 20 seconds about the whole exchange. Then it was down to business. 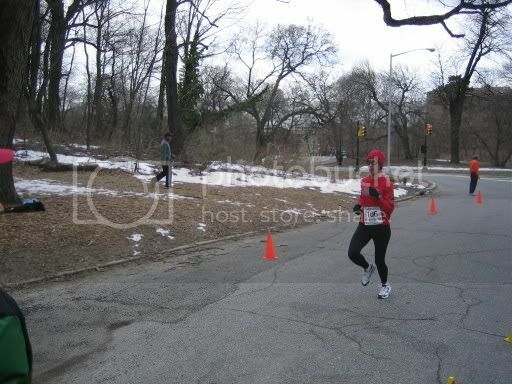 My goal was to run a hard lap of Prospect park. I remembered from last year that there is about a mile of up hill. Granted it isn't extreme uphill, say like the Great Hill or leg 8 of RTB, but it's loooong! I forgot to start/stop my watch but I think I ran around 24:30...7:18 pace or so. Pretty satisfied. I handed off to Sempre Libera to close things out. 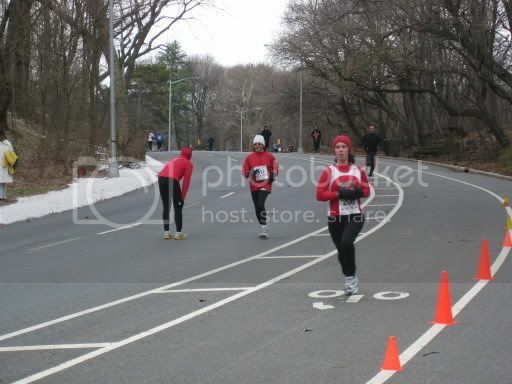 She absolutely showed Prospect Park who's boss with another round of sub 7 pace! Our team total came to 1:10:47...good for 8th overall! 1st overall for females! Wheeeeee!!! Unfortunately we didn't stay for the awards ceremony because it took forever but we did stay for the free massage and bagels with cream cheese and hot chocolate:-p At some point I have to head back to Brooklyn to pick up my running thermolite gloves:) Thanks to pink monkey and L'EQUIPE VITE-VITE for picking up the awards on the Speedy Beagles behalf! In other news, last night I headed west...the UWS that is for an "olympics party." On my way, along 86th and columbus I witnessed something one never wants to see but you know you're bound to see it at some point living in New York: a crime scene/dead body:( It seems a bus hit a pedestrian. Eek! Great job placing 1st ! It was thrilling to see so many TRD pups run this relay ! A bit sore today in my buns and hams - but I sucked it up and went to 'Chisel' for my weight training/toning. I'm seeing cute muscles in my arms for the first time in a very long time !! I saw you guys hand off to each other, while I waiting to go third in the relay. Great job coming first! It WAS so cold, wasn't it? And I swear they started a minute or two early! It was definitely cold but thankfully not as cold as last year's race!! And one of the things with small races...it doesn't necessarily things start on time or a bit late...I definitely was happy that I was second and not first! good job and congrats on the hardware!! looked like fun!